Most of us are familiar with the concept of airline miles, but to really maximize your travel opportunities, it’s helpful to dig in a bit more into how airlines work with each other, with banks, and how you can make those partnerships work for you. Alliances and partnerships are the building blocks of award travel, so it’s important to understand how these work before we get started. Most legacy airlines (that means the big-name traditional carriers, as opposed to the smaller or low-cost carriers) are affiliated with other legacy airlines, either through alliances or individual partnership agreements. In many cases, this means that you can fly Airline A, and earn miles on Airline B. When you go to redeem your miles, you can often use Airline B’s miles to fly on any number of other airlines, including back on Airline A! 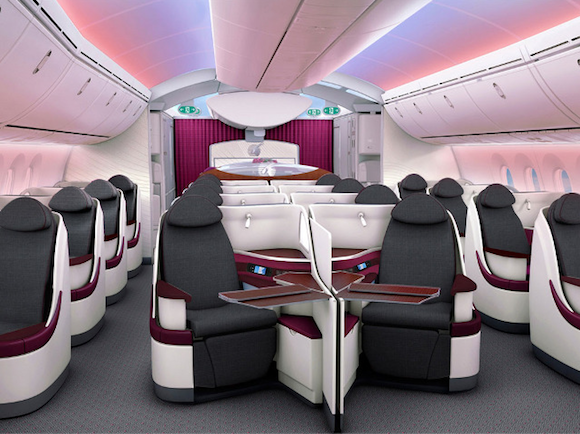 You can fly Qatar Airways business class using miles from many of their airline partners. Several of the Star Alliance airlines actually share a frequent flyer program, Miles & More, so that adds an extra layer of confusion. We don’t need to worry about that just yet. Similar to the Miles & More program within Star Alliance, several SkyTeam airlines share a frequent flyer program called FlyingBlue. Additionally, there are several other airlines that aren’t part of a particular alliance necessarily, but have partnerships with each other, or with other airlines – even those in the main alliances. Alaska Airlines, for example, is partners with a dozen or so airlines, such as American Airlines and Delta Air Lines, even though American is in oneworld and Delta is part of SkyTeam. We’ll talk more about each program and their partners later in the series (and every day on the blog), so for now the important take-away is that regardless of what miles you have, you likely have many more options for redeeming your miles than you may have thought. For the most part you really can’t transfer miles from one airline to another, so it’s best if you can accrue miles on one or two key programs within each alliance. If you have 25,000 Air France FlyingBlue miles, there’s no way to combine them with 25,000 Korean Air Skypass miles, even though they’re both in the SkyTeam alliance. You can redeem on the various partners, but you’ll always follow the rules of the program you have miles with, so it’s important to know what those are. The miles you have dictate which award chart you follow, and what the rules are. So if you have US Airways miles, you are going to follow the terms and conditions of the US Airways program, no matter which airline you end up flying. 1) Can I use the new TAM FIRST CLASS lounge instead of AAdmirals Club? They are both members of ONE WORLD ALLIANCE. 2) On the second leg of my trip, (MIA-MCO), will I have access to the lounges as well? @ Eliz — The TAM first class lounge is exclusively for TAM passengers as far as I know, unfortunately. You can use the lounge in Miami, though. Is there any alliance of any kind with this airline? and so my interest ? It seems that most AA EconomyMileSaver awards to from North America to Europe or Africa are routed through London where a connection to BA is made. BA then adds on an outrageous surcharge that can equal the price of the leg out of London. What is your strategy to in this situation? @ kevin — Try booking one of American’s other partners. For travel to Europe, look at space on airberlin, for example. For travel to Africa, look at space on Qatar Airways, which requires calling American to book. So does having more than one alliance helps? I actually have Star alliance from both SIA and Thai. And I also have One World membership from Qatar. I also have Skyteam from Garuda indonesia. What do u say about having all 3 of these together? I can’t help it cos I tend to travel on cheapest business class tickets most of the time and this is what I get. Capitalizing on miles on just one card is just not cost friendly sometimes for me. @ Marco — If you usually fly with all three alliances then absolutely, that makes sense. But I’d just stick to one program within each alliance whenever possible. Which star alliance partner would you recommend to pool miles with? I’ve been thinking about Singapore airlines as I’d like to fly theirs first class suites at some point but I’m not sure if I should consider others. It would probably be useful if the airline I earn miles with is a transfer partner of Amex UK as well. Any suggestions of thoughts would be appreciated. @lucky sorry to pester you but Amy advice on the above would be much appreciated, thanks! @ David — How much a year do you fly, and primarily in which fare classes? That would help me make an educated suggestion. @Lucky – I fly maybe 3-4 economy return trips within Europe originating in London each year and 1-2 long haul per year in economy/business, for example in flying ARN-HKT in Qatar/Cathay business class on a revenue ticket in feb and and LHR-HER economy in sep. Thanks. @ David — Hmmm, well in that case I might do Singapore as far as Star Alliance programs go. That being said, your travel on your upcoming trip seems to be on oneworld, in which case I’d consider crediting to a program like British Airways Executive Club. I have points Frequent flyer points with Qantas, I don’t travel much, but hope to travel to the UK in 2016. Qantas ask alot of points to fly there, is there any way I can use my frequent flyer points through one of their alliances to maximise what I have? Hi I live in Australia and have frequent flyer points with Qantas and would love to fly to America next year with the help of my points….but all of your information is based on American Airlines and credit cards …what can I do from this side of the world to achieve my goal ? Hello Lucky, I have flown a bit in the last year, but never really applied for my bonus flying miles, can I get these lost miles added to my frequent flyer card? Thx for your help and time. @ Susan — In many cases you can indeed request retro credit for miles you’ve already flown. You’ll want to check the terms of the individual programs to see their policy on requesting retro mileage credit. I’ve been trying to book flights using my Qantas points (800,000 + 950,000 Amex). International Business class FF tickets are impossible to get with Qantas for a Qantas flight.To book a flight on American using my Qantas points I have to book through Qantas-none available. When i call American directly there are FF seats available but I have to book through Qantas to use Qantas points -none available ! The same happens with Virgin/Delta. Round and round I go and my points seem impossible to use. It seems the airline holding the points only has access to a limited number of seats on the partner airlines. How do I get around this? Beyond that, if you’re looking at flying between Australia and North America, it can make sense to route via Asia. It take a bit longer, but there are more planes flying in general, so availability tends to be better. Thanks for your advice Tiffany. I’ll try the Asia routes- fingers crossed! Otherwise I can always use the points for hotels. Also your link is very informative. I usually travel 2 full trips to Boston from Mumbai every year using lufthansa. I mostly take economy but sometimes business as well. I was wondering if you had any suggestions on accumulating miles with star aliance or making the most of them while booking travel rewards. Im also considering applying for the miles and more card to get 50000 bonus miles. I just want to clarify. In the example at the top you say You can fly on Airline A and use the miles on Airline B as they are in the same alliance. Then below you say you CANNOT combine the the miles from multiple airlines even if they are in the same alliance. I may be overthinking this but those seem like contradictory statements. Can you help clarify this for me. Thanks for the help. I have noticed with the star alliances, whether with an air Canada/united when you want to chose business class, they grapped the double mileage for business class for 1 or 2 hours flight, then the connection flight 8/10 hours on Economy class, but if one choose business class, its not for a short 1 or 2 hrs flight and connection which is sometimes 5 or more hours wait, then they take the full mileage for business class, which is very unfair!!! Air Canada charges fuel which is $450 on top of all airports taxes, same for Luftansa, Belguim, Swiss air …..
Nice page and good advise !! Well need your advise !! Had Star Alliance card, normal fly from Copenhagen, Denmark to Bangkok/Thailand and the Ho Chi Minh city/Vietnam and return , normal use Turkish Airlines or Thai Airways. HI we have a daughter now living in Boston and we will be flying more Sydney to New York as well as her and her husband travelling here. We currently have Qantas and Virgin loyalty points. Are we better off joining American Airlines rewards? If so how is tis best utilised? I hope you can help me as I haven’t been able to make any headway using the United Website, Air China website or Star Alliance website : i have miles on United but am flying Air China to Beijing soon – I paid for my ticket – economy fare. since both United and Air China are members of the Star Alliance, would it be possible for me to get an upgrade using my United miles? how would I go about that please? any advice would be much appreciated. Your blog is awesome – thanks for all you do for us travelers! Thanks for this article. I don’t want to sound dumb but am kind of confused. I have points with tons of various airlines that are a part of star alliance. How do I earn plantnium or gold status on star alliance through all my points? Is it that once I get enough points from various airlines, star alliance will tally them all up and automatically upgrade my Tier status? Or will each airline individually update my status once I’ve earned enough on their airline? Example: I fly Ethiopian a lot right now and have racked up a lot of points but after this year will likely never fly with them. So are those points put to waste or can I transfer those to another airline within star alliance? @Cassie: You only need to be member of one frequent flier program within one alliance and you can collect miles from other airlines within the same alliance. In your example it would be enough to join Ethiopian and then collect miles also from Lufthansa, United, etc. If you are member of several programs within one alliance, which means you will have several frequent flier numbers, you most likely will never get anything significant out of it. Star alliance does not add up different carriers’ programs miles if credited to different frequent flier numbers. Thus said, better focus on only one program and use this one frequent flier number during your other trips on star alliance partner flights. Interesting article, thanks. In my case, I have 16506 avios in British Airways Executive Club, 19896 mileage at FlyingBlue (KLM) and 10137 mileage with United MileagePlus. Would you please help me how I can consolidate this mileage balance to get at one ticket reward in any airline from Panama to Europe, USA or Brazil. I’ve been wanting to book an “around the world” trip for my wife and I using miles. I have around 600k United MileagePlus miles (After using about 400k for our honeymoon to New Zealand and Fiji.) I made Global Services this year for United and would like to maximize my ability to get upgraded or using miles along with lounge access. We currently live in Munich. Thoughts? Ideas? Suggestions? Thank you. Hello, I travel quite a bit on numerous airlines. I don’t believe that sticking to one network’s airlines if I have to pay a huge premium, but I do like to accumulate points. I have points in Qantas, Emirates, Singapore and Velocity, so if I fly with an airline that is partners with any of these, I earn points in these programs. Question: am I getting the same amount of points if I fly airline A and earn points of that flight in airline B’s program as if I would earn them on airline A’s program? Simply put: If I fly an airline I’m not a member of, will they put the same amount of points in their partner airline’s account as they would in their own FF program? I recently transferred points from AMEX (have a Platinum) to Delta for miles. I’m reading more of your blog and frequently you mention retaining the AMEX points. How does this empower your point leverage? We travel quite a bit in South America (it’s expensive to travel here unfortunately) and I’m looking to maximize points on LAN and Aerolinus Argentina…or Delta for flights home. Hi I have 245,000 Virgin Atlantic MIles but have been unable to use them at all, they will only give you a reward flight when the flights are not full so for years now I have been unable to use them on any route. I have tried from UK to the Australia, South Africa, etc, with no success and I am almost about to just give up trying to get anywhere with these miles. I fly airline A regularly but always credit airline B for status. Having achieved gold status with airline B, i now use airline A’s lounges. So i assume the lounge use costs airline B when i use it. My question is does airline B get some remuneration via me associating my B membership with my flights on airline A? I am about to fly on Korean Air to Korea and Vancouver (sky team) and Cathay Pacific from Vancouver to JFK (0ne world). I am close to Platinum in American One World. Can I use my One World number for the whole trip or can or should I split between my Delta and American numbers?